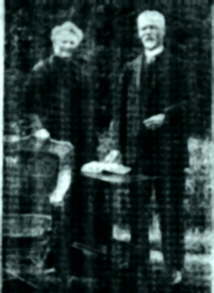 Mr and Mrs William Somerville, Hillview, Maryfield Place, Bonnyrigg, which takes place this weekend. 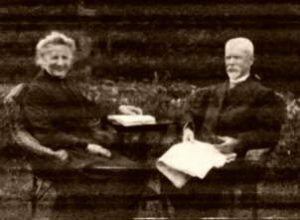 They were married at Melville on 12 June 1872, by the late Rev W C Brodie, UF Church, Lasswade and they have resided in Bonnyrigg since. Mr Somerville can almost be described as a native of Bonnyrigg, for although not born there, he has stayed in it since he was four years of age, while Mrs Somerville is a daughter of the late Mr James Baillie, Melville. As a business man, Mr Somerville was well known in the district, and for many years he successfully conducted a glue work at Whinny Row, Lothian Street, Bonnyrigg, which he gave up about 16 years ago. This business occupied most of Mr Somerville’s time, but he found occasional opportunity to interest himself in public affairs though not in an official capacity. In politics his sympathies were with the Liberal cause and the local Association had the benefit of his support. He is an ardent church worker, and holds the office of elder in the Bonnyrigg Church of Scotland. There is a family of one son and two daughters, and it is a happy circumstance of the present occasion that the son and a daughter are at present home on a holiday from America. There are also ten grandchildren and one great grandchild. Although they have now reached the ages of 86 and 82 respectively, Mr and Mrs Somerville still enjoy quite good health, but owing to a recently family bereavement, the diamond wedding will be very quietly observed. Comparatively few people are privileged to complete 60 years of married life, and to Mr and Mrs Somerville the hearty congratulations of a wide circle of friends will go forth on their having achieved this distinction.